Get out in the fresh air! 17 Nisan 2019 Çarşamba 21:02 - 1 reads. Binz is a special place: The Uetliberg is tangible, despite many new buildings, many old industrial buildings, flowering trees and plenty of space. Particularly well, the neighborhood feels on the sun terrace of the restaurant Binz & Kunz. It is located on a wasteland on the Raeffelstrasse. High steps lead to a gazebo that is lit by the sun until it sets. He is part of a huge urban garden restaurants, was expanded in the winter months, to 25 percent. It now offers space for 800 people. Starting in may, you can also have Breakfast and brunch. Ensure that the place is operating as the opposite side of the Restaurant Daizy to a full day. Otherwise, the Binz & Kunz, which starts this year in the third season, his culinary concept of loyalty: The focus is on Mezze in a Lebanese style. Because Fayad Moudi, the operator of the Binz & Kunz, but also of Moudis Bar, Tasty garden, and a Delicious Café, Mezze specialist. There are different plates (18 Fr.) with striking good Hummus, Labneh (yogurt cream cheese) or Muharra, a Chili-walnut Paste with pomegranate. Everything is served in beautiful Oriental bowl. On the grill the Halloumi fry, beef or chicken kebabs. Homemade Falafel Burger (14 Fr. ), Cheeseburger (15 Fr.) as well as Wiedikerli (2 PCs. 9 Fr.) from the nearby butcher's basement at the manesse place the self-service complement the offer. Not only the Binz, in other places just the spring is awakening in. 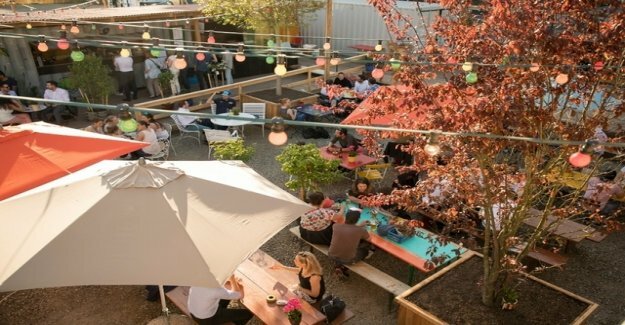 Frau Gerolds Garten in district 5, a pioneer in matters of urban Zurich Outdoor catering, is launched this week, just as in the season as the Rose in Rüschlikon. The pretty Restaurant with a big terrace, we went like so many: After the first warm temperatures in mid-March, the Open-Air season in April broke again total. "The more we are pleased that we can open on Saturday. The weather," says Denise Hofmann of the Rose, "is promising".